I haven't given proper attention to what has recently become one of my absolute favorite cookbooks: FRENCH FOOD AT HOME by Laura Calder. I have tried twelve recipes so far and every one of them - I do not exaggerate - has been a smashing success. Truly. And shockingly simple to make. Last night, I tried the Pear Pork for the first time. 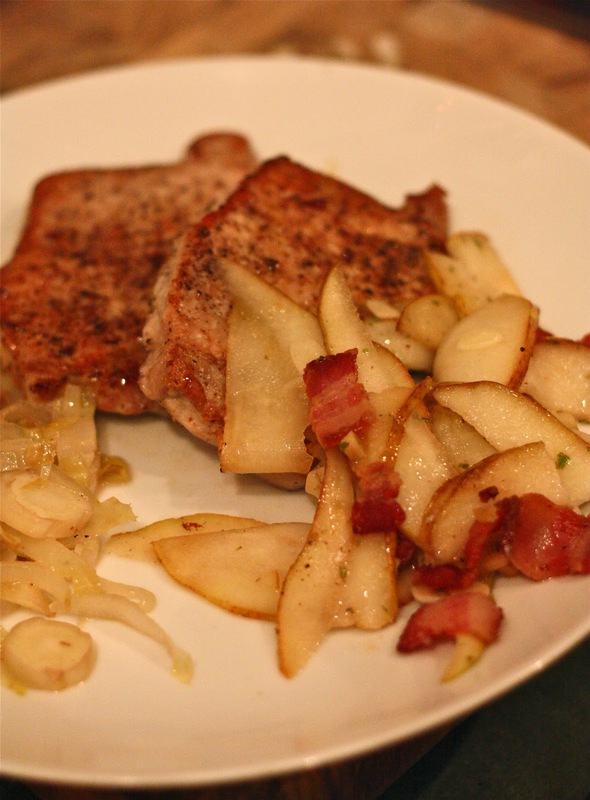 It didn't sound difficult to make, and I'm just in love with all things pear-related right now, especially when they're paired with bacon, as in this recipe. I just adore sweet and salty pairings, don't you? As usual, I changed a few things about the recipe that appears in the cookbook. The original recipe calls for 2 pork tenderloins, 3/4 lb each, but I substituted boneless pork chops, cut about 1/2-inch thick. That cut the oven time by about 10 minutes (bonus!). Calder says to use "white wine or apple juice"...but I happened to have some apple cider and decided to give that a go; to be frank, I don't know that I would have noticed the difference between any of the three options. Use whatever you have handy. Lastly, I love garlic. So I amped it up to 5 cloves of garlic over the called-for 4 cloves. Why do I tell you all this? Because I just want to illustrate that it really can be quite easy to change around most recipes to suit your own tastes and preferences. Laura Calder gave me the recipe created for her own tastes, I changed it to suit me, and I certainly expect that, should you try this, you'll change it up too. Which is, among many reasons, why I love and adore cooking: the choices and opportunities for creativity are endless. But enough of my babbling. Let's get on with the recipe, shall we? 1. Preheat the oven to 325 degrees. Season pork with salt and pepper; set aside. 2. Preheat a skillet until very hot. Add 1 tablespoon of the olive oil and fry the bacon until browned, about 3 minutes. Remove, leaving the fat behind, and toss together with the pears, garlic, ginger, rosemary, and another tablespoon of oil in a baking dish. Add the remaining oil to the skillet, if needed (note: I didn't need the extra oil - the bacon I used left behind quite a bit of fat). 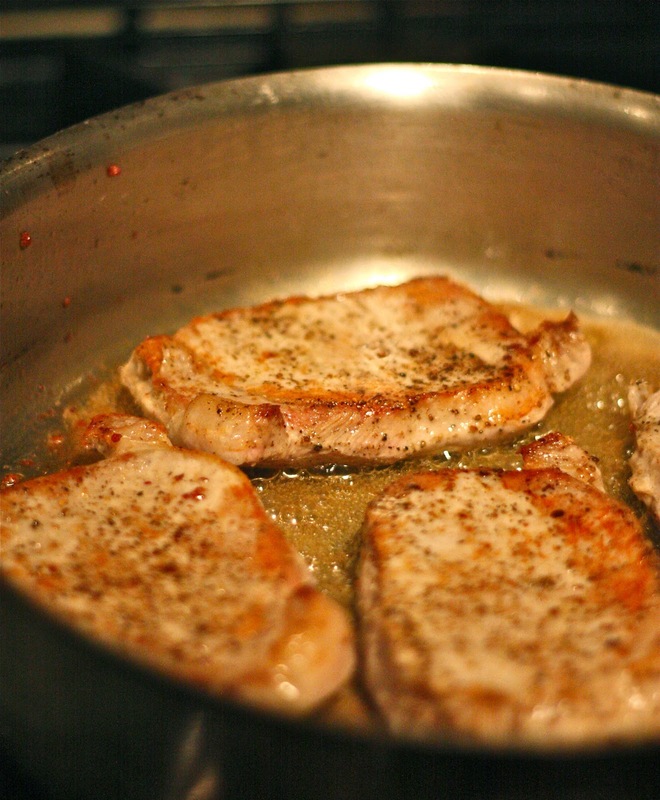 When sizzling, brown the pork well on both sides, about 3 minutes each side. Remove and nestle in the baking dish. 3. Deglaze the skillet with the wine (careful, it spatters! ), scraping up the good bits on the bottom, and boil until only about 1 tablespoon remains. Add the stock and boil to reduce to 3-4 tablespoons. Pour over the meat in the baking dish. Transfer to the oven and roast until the pears and garlic are soft and the meat cooked through, about 20 minutes. A NOTE ON KID-FRIENDLINESS: This one wasn't too successful. I tried scooping just the cooked pears and bacon onto Bug's plate. Added some apple slices. I also served sliced bread with honey butter, and Bug had two slices of that. But she somehow managed to pick out all the bacon pieces, eating only one bite of the pear, declaring she didn't like cooked pears. Le sigh. So my kid had buttered bread, apples, and bacon pieces for dinner. But...still...fruit, starch, protein in one meal? Success! NOTE ABOUT THE SIDE: I served this with endives that I sliced, sauteed with butter, then tossed with some honey and walnuts. Add a little salt and pepper - done. It worked...okay. Adam liked it much better than I did. This was a great weeknight option. Other than the very short stove-cooking time, everything got put into the oven. Which meant I had 20 free minutes to enjoy a glass of wine (Beaujolais) and help Bug with homework. With Christmas carols playing in the background. A great night. Eat, drink, and give FRENCH FOOD AT HOME a try. have i told you lately that i love you? loved reading this even tho me and pork, not so much. That looks stinkin YUM! Wish I was there for dinner last night. Santa has received his gift request from me. I have the feeling "French Food at Home" will be under my tree and Kiddo and I will expand our cooking adventures right away!